Thinking of your left-over mincemeat, a few years ago, in an attempt to limit carbs at holiday time, I decided on a substitute for mince pies. Instead of pie crust, I took fresh apples and pears, took out the core, stuffed them with mincemeat, put them in the oven until hot, and served them with real whipped cream (without sugar). They were fantastic and satisfied both those who liked mince pies and those who did not. They would also be great with vanilla or eggnog ice cream. That sounds delicious! I might try it with some of my leftovers. OMG, those pies sound absolute delicious! Let us know if you try them out! 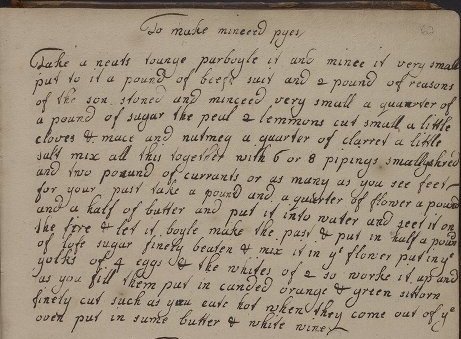 This recipe’s from 1698? I need to read up on my history more: was this before English colonization of India? It’s been about a year since I read Lizzie Collingham’s “Curry: a Tale of Cooks and Conquerors_ and five years since I read Paul Freedman’s _Out of the East: Spices and the Medieval Imagination_. This makes me want to read them again. People can forget how heavily spiced European-American food was in those days – and *not* because people were trying to cover up tastes of spoiled meat. Cotton makes a note of 1698 as her “start date.” The book was likely used throughout the eighteenth century and England was involved in trade and colonial projects in South Asia during this period. I hope you enjoy revisiting those books (and cooking this recipe)! I like Mary V. Thompson’s reply above. That sounds really good. I’ve made this minced meat as directed and the tongue is delicious, if you don’t think about it too much and it is well cooked until tender. My only suggestion is that the recipe calls for GREEN CITRON (rather than lemon peel), which is the candied preserved rind of the citron melon, and used frequently in the 18th century. I just bought some myself today at my Giant Supermarket in order to make 17th century doughnuts. (You’ll find it with the other ingredients for fruit cake this time of year.) In the 18th century you would have saved all of your fruit rinds and peels by candying them, and then had them preserved and available for fruit cake or minced meat among other uses when needed. Wonderful! I’m so glad that they turned out well! Send us a photo if you get a chance. And thank you for the suggestion and clarification about green citron. I’ll have to investigate this more. I bet it would have added a wonderful bite. As luck would have it, not only do I have a photo of the preserved green citron to show you; I also have one of the melon! Such synchronicity! The preserved green citron really doesn’t have much of a taste except for the sweetness of the sugar preserving liquid. Of course soaking them in brandy overnight doesn’t hurt them any, nor the raisins that are also put into the center of the doughnuts. The recipe for doughnuts (oly-koecks) if by Peter Rose and found in her excellent book “The Sensible Cook.” I probably won’t be able to figure out how to post the photos here, so I’ll send them to you via email. I wonder if you’d used suet, bovine fat from around the kidney, if your pies would have had a less fatty mouth feel. It a traditional ingredient in fruit mince without meat and frankly, you’d never know it was there. It adds an incredible depth of flavour without greasiness. I did use suet! I purchased it from the butcher and grated it in myself. (It is very difficult to find a box of suet pellets in the US, but I have used that type of suet to make mincemeat in the UK.) I think the combination of the fattier tongue meat and the suet created that fatty mouth feel. It wasn’t unpleasant, but definitely noticeable. In any case, I brought the mince pies to a party and guests devoured them. Let us know if you give this recipe a try!